As I previously wrote for the BeaverLake6 Report, the Sewn Products Equipment and Suppliers of the Americas ("SPESA") held an "Executive Conference" in Washington, D.C. on October 18 with a strong program packed full of presentations on manufacturing that has remained in America, returned to America, or is being done in conjunction with our Western Hemisphere free trade agreement partners. To follow up on that, here are some highlights of the Conference dealing specifically with home textiles and apparel. Michelle Gloeckler, Senior Vice President - Home, Wal-Mart, spoke on that retail giant's commitment to buy an additional $50 billion in U.S. products over the next ten years. Over the past few years I have been asked, several times, where to find bath towels made in America. Well, now I am happy to tell friends, Go to Wal-Mart, for their "Made Here" line of towels, made in the U.S.A. from 100 percent U.S.A. grown and spun Pima cotton. Textile consultant Mary O'Rourke (www.orourkegrouppartners.com) presented a round up of brands and retailers who have continued to manufacture in the U.S., have returned manufacturing to the U.S., or who are manufacturing in our Western Hemisphere free trade partners using U.S. yarn and fabric. Kevin M. Burke, President and CEO, American Apparel and Footwear Association -- a group often associated with the trend source apparel from low-cost regions of the world -- told us how fashion brands and retailers are rethinking sourcing strategies. He said that until recently the trend had been to make everything in East Asia, but that major brands and retailers are moving some jobs back to America. John Martynec, Vice President of Manufacturing, Brooks Brothers, informed us that 70% of the men's suits sold annually by that retailer are made in their Southwick factory in Haverhill, Massachusetts. Brooks Brothers is also making shirts in North Carolina and neckties in New York. In related news -- American Made Matters® (www.americanmadematters.com), an organization dedicated to educating consumers on the importance of buying American-made products, has declared November 19, 2013 the first annual American Made Matters® Day. On this day, American Made Matters® is encouraging consumers to buy at least one American-made product to show their support for American manufacturing. Additionally, the event will kick-off a movement encouraging Americans to buy products made in America throughout the upcoming holiday shopping season. The National Association of Manufactures has submitted, to the Office of the United States Trade Representative, comments regarding foreign trade barriers that hinder U.S. exports. In an October 17, 2013, Binding Ruling Letter (N246116) said that flocked carpet tiles, referred to as Ambrosia, of 50 centimeter square, consisting of a nylon flock surface, an intermediate non-woven layer, and a backing that is made from PBT (Poly Butylene Therephalate), are classified at 5705.00.2030, Harmonized Tariff Schedule of the United States (HTSUS), which provides for other carpets and other textile floor coverings, whether or not made up: other… of man-made fibers. The duty rate will be 3.3 percent ad valorem. The carpet tiles are imported from China by Commercial Investments International, Inc.
On November 8, at 9:30 a.m., the interagency Trade Policy Staff Committee will convene a public hearing to assist the Office of the United States Trade Representative in the preparation of its annual report to the Congress on China's compliance with the commitments made in connection with its accession to the World Trade Organization. The hearing will take place in Room 1, 1724 F Street, N.W., Washington, D.C. 20508. This hearing originally was scheduled to take place on October 4, 2013, but was postponed due to a lapse in appropriations for Federal government agencies. For further information, see Request for Comments and Notice of Public Hearing Concerning China’s Compliance with WTO Commitments, 78 Fed. Reg. 49787 (Aug. 15, 2013), and www.regulations.gov , docket ID USTR-2013-0026. The Advisory Committee on Commercial Operations of Customs and Border Protection ("COAC") will meet on November 15, 2013, from 1:00 p.m. to 5:00 p.m. EST, in Washington, D.C. The meeting will be open to the public. For members of the public who plan to attend the meeting in person, please register either online at https://apps.cbp.gov/te_reg/index.asp?w=12; by email to tradeevents@dhs.gov; or by fax to 202-325-4290 by 5:00 p.m. EST on November 13, 2013. For members of the public who plan to participate via webinar, please register online at https://apps.cbp.gov/te_reg/index.asp?w=13 by 5:00 p.m. EST on November 13, 2013. Comments must be submitted in writing no later than November 7, 2013, and must be identified by Docket No. USCBP-2013-0041, and may be submitted by one of the following methods: Federal eRulemaking Portal: http://www.regulations.gov; Email: Tradeevents@dhs.gov (Include the docket number in the subject line of the message); Fax: 202-325-4290; or Mail: Ms. Wanda Tate, Office of Trade Relations, U.S. Customs and Border Protection, 1300 Pennsylvania Avenue NW., Room 3.5A, Washington, D.C. 20229. Instructions: All submissions received must include the words "Department of Homeland Security" and the docket number for this action. Comments received will be posted without alteration at http://www.regulations.gov, including any personal information provided. Do not submit personal information to this docket. 1. The One U.S. Government at the Border Subcommittee: Review and discuss recommendations from the Food and Drug Administration (FDA) Working Group, review and discuss an update on the progress of the Environmental Protection Agency (EPA) Working Group, and review and discuss a case study regarding the Partner Government Agency--Message Set (PGA-MS). 2. The Global Supply Chain Subcommittee: Review and discuss recommendations regarding the Air Cargo Advance Screening (ACAS) pilot and address the next steps regarding land border issues in the area of Beyond the Border and 21st Century Initiatives. 3. The Trade Modernization Subcommittee: Review and discuss recommendations addressing the Automated Commercial Environment (ACE) Development and Deployment Schedule and recommendations of the Role of the Broker Work Group. 4. COAC Survey Team: Review and Discuss Preliminary Results of the COAC 2013 Annual Trade Efficiency Survey and discuss feedback on past COAC recommendations. 5. The Trusted Trader Subcommittee: Review and discuss the Customs-Trade Partnership Against Terrorism C-TPAT criteria for exporters. 6. The Trade Enforcement and Revenue Collection Subcommittee: Review and discuss the work completed to date on the Regulatory Audit Working Group's findings on the planned enhancements for the Focused Assessment process and the Intellectual Property Rights Working Group's effort to further evaluate the use of the Global Shipment Identification Number (GSIN) as a possible tool for use in Distribution Chain Management in Intellectual Property Rights Compliance. 7. The Export Subcommittee: Review and discuss subcommittee recommendations and the analysis of the 2013 COAC Export Survey Results. Description: The BreathableBaby BreathableSacks are sleeveless, wearable blankets. They come in two sizes: small (10-18 pounds) and medium (16-24 pounds) and come in three colors: kiwi Whoo, pink Hip, and blue Splash. There is one animal stitched on the left chest of each blanket of an owl, hippo or elephant. Only BreathableSacks from Lot No. 124 with a manufacture date of 04/17/2012 are included in the recall. A tag sewn inside the recalled units where the infant’s right foot would be located states the “Date of Manufacture: 04/17/2012, Lot No. 124,” along with the washing instructions on the back of the tag. Remedy: Consumers should immediately stop using the BreathableSacks from Lot No. 124 and contact BreathableBaby to request a replacement garment. Sold at: Various stores and online retailers, and at www.breathablebaby.com, nationwide from June 2012 to August 2013 for about $20. 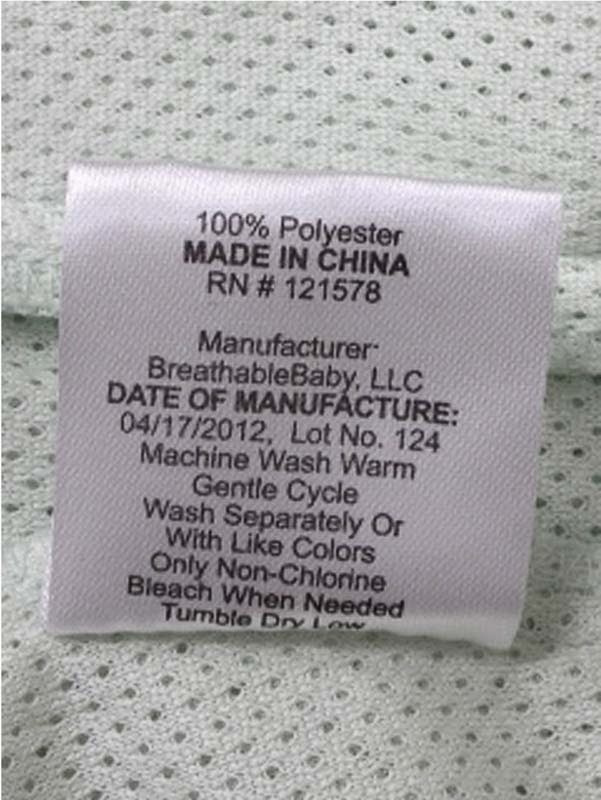 Importer: BreathableBaby LLC, of Minnetonka, Minn. The Sewn Products Equipment and Suppliers of the Americas ("SPESA") held an "Executive Conference" in Washington, D.C. on October 18 with a strong program packed full of presentations on manufacturing that has remained in America, returned to America, or is being done in conjunction with our Western Hemisphere free trade agreement partners. David Trumbull was there and reported on the event for the BeaverLake6 Report. What's more iconic in America than blue jeans? David Trumbull was interviewed for CNBC in relation to the European Union's 38 percent tariff on American women's blue jeans, read it HERE. United States Trade Representative Michael Froman today expressed serious concerns about the enforcement of Guatemala's laws protecting worker rights, saying that significant work remains to ensure that an Enforcement Plan signed by the Guatemalan government earlier this year is effectively implemented. Ambassador Froman recognized important steps taken by Guatemala under the plan, but communicated to Guatemalan officials today that the United States expects solid progress in fully implementing the commitments over the next six months. If Guatemala fails to comply with the provisions of the Enforcement Plan, the U.S. Government retains the right to reactivate an arbitration panel established in the 2011 labor enforcement case brought under the Dominican Republic-Central America-United States Free Trade Agreement ("DR-CAFTA"). On April 26, 2013, the United States and Guatemala signed the 18-point Enforcement Plan outlining concrete actions to strengthen labor law enforcement in Guatemala, which Guatemala committed to implement within six months. Guatemala has adopted a number of reforms, consistent with applicable deadlines, but implementation of those reforms is key to improving worker rights in Guatemala. While the arbitration panel will not be reconvened at this time, Ambassador Froman stressed that much work remains to be done to ensure effective implementation. More information is available on the USTR website HERE. October 28-30, Assistant U.S. Trade Representative for Europe and the Middle East Dan Mullaney will travel to Europe to meet with government officials, businesspeople, and stakeholders to discuss the Transatlantic Trade and Investment Partnership ("T-TIP") in Berlin, Germany, and Paris, France. Tennier Industries Inc., Boca Raton, Fla., has been awarded a maximum $22,977,600 modification (P0008) exercising the first one-year option period on a seven-month base contract (SPM1C1-13-D-1029) with two one-year option periods for trousers. This is a firm-fixed-price contract. Location of performance is Florida, Tennessee, and Kentucky with an Oct. 31, 2014 performance completion date. Using military service is Army. Type of appropriation is fiscal year 2014 through fiscal year 2015 defense working capital funds. The contracting activity is the Defense Logistics Agency Troop Support, Philadelphia, Pa.
San Diego, CA – United States Attorney Laura E. Duffy announced in a PRESS RELEASE this past week Los Angeles-based businessman Sunil Jiwat Mirwani was sentenced to 27 months in prison for evading customs duties on more than $30 million in Chinese-made wearing apparel. The sentence, handed down by U.S. District Judge Michael M. Anello, also required Mirwani to forfeit his interest in over $30,000 in cash, the contents of a Hong Kong-based bank account—plus an inventory of more than 220,000 pairs of blue jeans valued at more than $1 million. In addition, Judge Anello sentenced Mirwani’s corporation, M Trade, Inc., to five years of probation. The Manufacturing Council will hold a meeting to discuss the work the Council will focus on for the remainder of its term. At the meeting, the Council will hear updates from its four subcommittees on workforce development and public perception of manufacturing; manufacturing energy policy; tax policy and export growth; and innovation, research and development. The Council will discuss current workforce development efforts by the federal government, the importance of alternative energy technologies for manufacturers, the effects of current tax policies on manufacturers, and the importance of continued research and development for the manufacturing industry. A final agenda will be available on the Council's Web site one week prior to the meeting. The Council was re-chartered on April 5, 2012, to advise the Secretary of Commerce on government programs and policies that affect U.S. manufacturing and provide a means of ensuring regular contact between the U.S. Government and the manufacturing sector. DATES: November 13, 2013, 9 a.m.-12 p.m. Central Standard Time (CST). ADDRESSES: The meeting will be held at the Hilton Americas--Houston, 1600 Lamar Street, Houston, TX 77010 in the Lanier Grand Ballroom. Due to building security, all attendees must pre-register. This meeting will be physically accessible to people with disabilities. Seating is limited and will be on a first come, first served basis. Requests for sign language interpretation, other auxiliary aids, or pre-registration, should be submitted no later than November 6, 2013, to Elizabeth Emanuel, the Manufacturing Council, Room 4043, 1401 Constitution Avenue NW., Washington, DC 20230, telephone 202-482-1369, elizabeth.emanuel@trade.gov. The Manufacturing Council serves as the principal private sector advisory committee to the Secretary of Commerce on the United States manufacturing sector. The Council is charged with ensuring regular communication between the federal government and the manufacturing sector, advising the Secretary of Commerce on government policies and programs that affect United States manufacturing and provide a forum for discussing and proposing solutions to industry-related problems and to ensure that the United States remains the preeminent destination for investment in manufacturing throughout the world. SUPPLEMENTARY INFORMATION: A limited amount of time, from 11:30-12, will be made available for pertinent brief oral comments from members of the public attending the meeting. To accommodate as many speakers as possible, the time for public comments will be limited to 5 minutes per person. Individuals wishing to reserve speaking time during the meeting must contact Ms. Emanuel and submit a brief statement of the general nature of the comments, as well as the name and address of the proposed speaker, by 5 p.m. Eastern Standard Time (EST) on Thursday, November 7, 2013. If the number of registrants requesting to make statements is greater than can be reasonably accommodated during the meeting, the International Trade Administration may conduct a lottery to determine the speakers. Speakers are requested to bring at least 25 copies of their oral comments for distribution to the members of the Manufacturing Council and to the public at the meeting. Any member of the public may submit pertinent written comments concerning the Manufacturing Council's affairs at any time before or after the meeting. Comments may be submitted to Elizabeth Emanuel, the Manufacturing Council, Room 4043, 1401 Constitution Avenue NW., Washington, DC, 20230, telephone: 202-482-1369, email: elizabeth.emanuel@trade.gov. To be considered during the meeting, written comments must be received by 5:00 p.m. EST on Thursday, November 7, 2013, to ensure transmission to the Manufacturing Council prior to the meeting. Comments received after that date will be distributed to the members but may not be considered at the meeting. The Foreign Trade Zone Board today published in the Federal Register (78 FR 63962) Approval of Subzone Status, Talbots Import, LLC, Lakeville, Massachusetts. Textiles and Trade Blog has followed this application since it was first published (http://textilesandtrade.blogspot.com/2013/06/talbots-applies-to-use-ftz-procedures.html. According to the application "The primary purpose for the Subzone is to facilitate exports to Talbot's Canada stores and exports elsewhere around the world servicing Talbot's customers." In the case of foreign apparel entered into the zone and later withdrawn for consumption in the United States, there will be no duty assessed when the goods enter the Subzone and duty will be assessed when they leave the zone and enter U.S. commerce. Thus Talbot's will save by deferring the duty payment to a date closer to the actually sale of the garments. In the case of goods entered into the Subzone for warehousing and later export to Canada or other foreign markets, Talbot's will pay no U.S. duty. According to the application, Talbot's employs 135 workers in Lakeville, Massachusetts and approval of the Subzone will "assist Talbot's in resisting pressure to move distribution activities for MA or the US, will retain employment at the proposed FTZ site, and potenially increase employment directly related to Zone Activity." Unable to attend the Industrial Fabrics International ("IFAI") and Specialty Graphic Imaging Association ("SGIA") expos in Orlando this week? Or attending and just overwhelmed by the size and breadth of the shows and need an overall orientation to this major textile industry event? Steve Warner is posting daily Special Reports on the BeaverLake6 Report. See Steve's updates at http://www.beaverlake6.com/?utm_source=BL6+102113+Primary+Opened&utm_campaign=BL6+092313&utm_medium=email. Weckworth Manufacturing, Haysville, Kan., has been awarded a maximum $15,000,000 fixed-price with economic-price-adjustment contract for sling cargo nets. This is a one-year base contract with four one-year options. This contract was a competitive acquisition, and four offers were received. Location of performance is Kansas with an Oct. 22, 2014 performance completion date. Using military service is Navy. Type of appropriation is fiscal 2014 defense working capital funds. The contracting activity is the Defense Logistics Agency Troop Support, Philadelphia, Pa., (SPE8EG-14-D-0002). The Leaders of Australia, Brunei Darussalam, Canada, Chile, Japan, Malaysia, Mexico, New Zealand, Peru, Singapore, United States, and Vietnam, have announced that their countries are on track to complete the Trans-Pacific Partnership negotiations. Ministers and negotiators report making significant progress in recent months on all the legal texts and annexes. They have agreed that negotiators should now proceed to resolve all outstanding issues with the objective of completing this year a comprehensive and balanced, regional agreement that achieves the goals we established in Honolulu in 2011, ensures the benefits of the agreement are fully shared, and takes into account the diversity of our levels of development. Prior to starting Agathon Associates, consulting in textiles and trade, Mr. Trumbull, was, for nearly 20 years, employed by the National Textile Association. He served, both under the administrations of President George W. Bush and President Barack Obama, as an industry adviser to the United States Trade Representative and the Secretary of Commerce. Incidents/Injuries: No injuries have been reported. Remedy: Consumers should immediately take the garments away from children. Consumers can remove the drawstrings to eliminate the hazard or return the garments to Trail Crest for a full refund. Contact Trail Crest for a return address label and instructions for returning the garment. 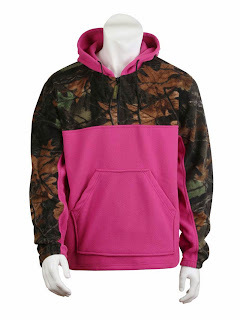 Sold at: Zulily.com and other stores nationwide from November 2012 to February 2013 for about $15. Importer: Trail Crest, Brooklyn, N.Y.
Pursuant to section 181 of the Trade Act of 1974, as amended (19 U.S.C. 2241), the Office of the United States Trade Representative ("USTR") will be publishing in 2014 a Report on Technical Barriers to Trade ("TBT Report") identifying and analyzing significant standards-related barriers to U.S. exports. The Trade Policy Staff Committee ("TPSC") of USTR is requesting interested persons to submit written comments to assist it in identifying significant standards-related barriers to U.S. exports of goods for inclusion in the report. DATES: Public comments are due not later than November 15, 2013. For more information see the Federal Register notice at 78 FR 63271. A marketer of iPhone accessories, bottle holders, lens cleaners, dog collars, leashes, and other outdoor accessories has agreed to settle Federal Trade Commission charges that it falsely claimed certain of its products were "Made in the U.S.A," or "Truly Made in the USA" even though the products contained substantial foreign content. The company claimed on its website that "For 28 years E.K. Ekcessories has been producing superior quality made accessories in our 60,000 sq. ft. facility in Logan, Utah;" and "Our source of pride and satisfaction abounds from a true 'Made in USA' product." In fact, the company imports many of its products and components, according to the complaint. The FTC also alleged that the company distributed deceptive promotional materials for its products to third-party retailers such as Amazon and REI. Under the proposed order, the company is prohibited from claiming that any product is made in the United States unless that product is all or virtually all made in the United States. The company also is prohibited from making any misleading claims about a product's country of origin and from providing deceptive promotional material to third-party retailers, or otherwise providing the "means or instrumentalities" for others to make deceptive U.S.-origin claims. The company also is required to contact all distributors who bought or received products between January 1, 2010 and May 1, 2013, and provide them with a notice and a copy of the order. According to the Commission’s 1997 U.S. Origin Claims Enforcement Policy Statement, for a product to be advertised or labeled as "Made in the U.S.A," the product must be "all or virtually all" made in the United States – that is, all significant parts and processing must be of U.S. origin, and the product should contain no (or negligible) foreign content. For more information see the FTC website at http://www.ftc.gov/opa/2013/10/ekcessories.shtm. ADAMSTOWN, Pa., September 9, 2013 – American Made Matters® ("AMM"), an organization dedicated to educating consumers on the importance of buying American-made products, has declared November 19, 2013 the first annual American Made Matters® Day. On this day, American Made Matters® is encouraging consumers to buy at least one American-made product to show their support for American manufacturing. Additionally, the event will kick-off a movement encouraging Americans to buy products made in America throughout the upcoming holiday shopping season. For more information see the AMM Press Release. October 23, 2013, U.S. Customs and Border Protection published in the Federal Register (78 FR 63052) United States-Panama Trade Promotion Agreement; Interim regulations; solicitation of comments. SUMMARY: This rule amends the U.S. Customs and Border Protection ("CBP") regulations on an interim basis to implement the preferential tariff treatment and other customs-related provisions of the United States-Panama Trade Promotion Agreement entered into by the United States and the Republic of Panama. DATES: Interim rule effective October 23, 2013; comments must be received by December 23, 2013. If you enjoy receiving the Textiles and Trade Blog from Agathon Associates, invite your industry colleagues to sign up and join the hundreds of textile industry and industry support leaders who receive these daily enewsletter. Just forward this message with imbedded signup link below. If you have a moment, you might add a brief note to your colleague explaining what you find valuable about the enewsletter. U.S. Customs and Border Protection has announced the need to postpone the much-anticipated East Coast Trade Symposium, previously scheduled for October 24-25, 2013, in Washington, D.C. due to the protracted lapse in appropriations, which significantly impacted CBP's ability to prepare for and commit the resources necessary to hold the event as planned. CBP is committed to hosting the event at a later date, and look forward to announcing the new dates for this event as soon as possible. For the registrants who have completed and paid for their symposium registration, CBP will be refunding registration fees. Agathon Associates has received an inquiry regarding 100% polyester 19 gauge tubular knit French terry loop fleece for use in production in the DR-CAFTA region. Note that the requested fabric must conform to the DR-CAFTA rules of origin. If you are interested in supplying this fabric, contact me at david@agathonassociates.com and I'll put you in touch with the inquirer. Yarn size: 150 Denier x multifilament - Spun (Yarn sizes may vary by +/-8%. Also, yarn size relates to the size of the yarn prior to knitting). Quantity Required: Approximately 625,000 lbs during months of February to June. The Trade Policy Staff Committee ("TPSC") of the Office of the United States Trade Representative is seeking the views of interested parties on the operation of the Caribbean Basin Economic Recovery Act ("CBERA"), as amended by the Caribbean Basin Trade Partnership Act ("CBTPA") (19 U.S.C. 2701 et seq.). Section 212(f) of the CBERA, as amended, requires the President to submit a report to Congress regarding the operation of the CBERA and CBTPA (together commonly referred to as the Caribbean Basin Initiative, or "CBI") on or before December 31, 2001, and every two years thereafter. The TPSC invites written comments concerning the operation of the CBI, including comments on the performance of each CBERA and CBTPA beneficiary country under the criteria described in sections 212(b), 212(c), and 213(b)(5)(B) of CBERA, as amended. This information will be used in the preparation of the report to Congress on the operation of the program. Public comments are due at USTR no later than 5 p.m., November 1, 2013. In a letter to the editor published in today's Wall Street Journal, Auggie Tantillo, President, National Council of Textile Organizations takes issue with the WSJ October 5th editorial "Pacific Trade Protectionists", stating that the "yarn forward" rule of origin for textiles and apparel has created over $25 billion in two-way trade with our FTA partners." As you may know Article 3.3.14 of the Colombia agreement and Article 3.3.14 of the Peru agreement contain provisions that authorize the negotiation of cumulation with other countries in the region. Such measures are urgently needed to help ensure that regional textile and apparel supply chains do not remain fragmented and that they can create unified markets for U.S. yarns and fabrics. Under current rules, Colombia can only use inputs from itself and the United States. Likewise, Peru is also restricted to textile inputs originating from itself and the United States. Such policies artificially sever regional supply chains that U.S. apparel companies use, increasing their costs while diminishing the size of key U.S. yarn and fabric export markets. The current situation also stands at odds with historical U.S. trade policies. As recently as last year, these countries could also use inputs from each other, from other Andean countries, and, in certain cases, from Central America. Whatever happens between the Democrats (the near occasion of sin) and the Republicans (no worse than a bad head cold) the United States government will be closed Monday, October 14th. It's Columbus Day. "We do not read even of the discovery of this continent, without feeling something of a personal interest in the event; without being reminded how much it has affected our own fortunes and our own existence. It would be still more unnatural for us, therefore, than for others, to contemplate with unaffected minds that interesting, I may say that most touching and pathetic scene, when the great discoverer of America stood on the deck of his shattered bark, the shades of night falling on the sea, yet no man sleeping; tossed on the billows of an unknown ocean, yet the stronger billows of alternate hope and despair tossing his own troubled thoughts; extending forward his harassed frame, straining westward his anxious and eager eyes, till Heaven at last granted him a moment of rapture and ecstasy, in blessing his vision with the sight of the unknown world." —Daniel Webster, First Bunker Hill Monument Oration, 1825. If Baby Makes Her Blue Jeans Talk, What Do They Say About Trade and American Manufacturing? Next week I'll be in Washington for the SPESA 2013 Executive Conference, where much of the talk will be of "reshoring," that is manufacturing jobs coming back to the U.S. Equally interesting is the concept of "near-shoring," that is manufacturing returning to the Americas, under a hybrid, U.S.-F.T.A. partner, model. A few days before the partial government shutdown, when trade data were still available from the Department of Commerce and the International Trade Commission, I pulled together some numbers to illustrate, for a CNCB reporter (see story here), how near-shoring works. The example I use is blue jeans, an iconic, American-invented product, but which has little current U.S.A. production. In 2012, the total value (landed, duty-paid) of all U.S. imports of denim trousers was $4.4 billion. That equates to 41,1 million dozen pair of trousers. The bulk of those were subject to the full 16.6 percent rate of duty and were mostly imported from Asia, in particular, China. However, 36 percent of all imports were duty-free under the provisions of a free trade agreement or trade preference program. Two programs in particular are of interest: the North American Free Trade Agreement ("NAFTA") and the Dominican Republic-Central America Free Trade Agreement ("DR-CAFTA"). Combined NAFTA (Canada and Mexico) and DR-CAFTA (Costa Rica, Dominican Republic, El Salvador, Gautemala, Honduras, and Nicaragua) accounted for over a quarter of all U.S. imports of denim trousers. Both agreements have what is called a "yarn forward" rule of origin, which means that jeans imported into the U.S. duty free under the terms of the agreement must be made of fabrics woven in one or more of the partner countries of yarn spun in one or more of the partner countries. Each agreement has loop-holes that allow some use of third country fabric, but a look at the trade data suggests that they are using a substantial amount of regional fabric, and that is helping U.S. denim fabric makers. How so? Well, to start off, our DR-CAFTA partners have little if any local production of denim. Mexico produces denim, as does the U.S. Therefore, not counting the loopholes that let some third-country fabric to be used, free trade in jeans under the NAFTA or DR-CAFTA must use fabric made in the U.S. or Mexico (Canada is not a significant producer of denim). So what do the data show? What jumps out is that the amount of denim fabric the U.S. makes and exports to our DR-CAFTA is sufficient to account for 95% of the jeans we import from those partners. In the case of NAFTA, U.S. fabric can account for 42% of the jeans we import duty-free under that trade agreement, which is rather high considering that Mexico has its own denim production. We must be careful with these numbers. The commodity codes for exports and imports are not precisely the same, and there is a single conversion number for all "trousers" which could encompass everything from the skimpiest "Daisy Dukes" to the largest plus-size trousers. However, when you see, in the case of DR-CAFTA, nearly 100% alignment of U.S. fabric exports and U.S. trouser imports, you know the true correlation, while perhaps not 94.5 percent, must be very high. With an all-new focus, format, and venue, the SPESA 2013 Executive Conference is the perfect place for the sewn products industry to learn from and network with industry leaders, government officials, and fellow executives. The conference features highly focused and relevant content designed to help sewn products industry suppliers better understand and act on today's critical industry issues, trends, and legislation. Northwest Woolen Mills, a division of Hyman Brickle & Son, Inc. has been awarded a five year contract with the Federal Emergency Management Agency. The contract is to establish a supplier capable of providing 100% cotton blankets to meet the needs of disaster survivors during response efforts and for general stock replenishment at FEMA distribution centers. Northwest Woolen Mills has also been awarded a one year contract with the U.S. Defense Logistics Agency. The contract is for a fixed quantity of 755,000 Disaster Blankets. The blankets will be produced at the company headquarters in Woonsocket, Rhode Island. The organizers of the Techtextil North America and JEC America plan to co-locate their 2014 events at the Georgia World Congress Center, Atlanta, GA on May 13-15, 2014. The co-location of Techtextil North America, Texprocess Americas and JEC Americas will provide a platform for suppliers and end-product manufacturers to access the entire high tech value chain. The strength of this strategic event is the opportunity to provide an unparalleled opportunity for technical textiles and composites manufacturers and suppliers to showcase their technologies, expand their expertise and network with a wide array of industry professionals and gain a competitive edge in the ever growing market, helping to provide a well rounded experience for our visitors. Composites are a growing, innovative product segment also for technical textiles. The agreement allows a blending within the technical textiles and composites value chain—material producers, technology and equipment manufacturers, end product fabricators and composite users. The co-location of the 11th Techtextil North America, the 2nd Texprocess Americas and JEC Americas will provide access to a more encompassing product range for both exhibitors and visitors. JEC’s third annual JEC Americas Exhibition & Conference in Atlanta will focus on the full composites value chain – from raw materials the manufacturing processes – and further underscores JEC’s unyielding commitment to the Americas composites industry. We are pleased about the partnership with Messe Frankfurt,Frederique Mutel, JEC Group, President & CEO adds. ―Both organizations are fully committed to to the industry. Both are experts of their sectors and produce high-value events. Together we will deliver a strategic event. This agreement is an important step forward for the Techtextil Brand, which consists of six shows worldwide including the established number one show in Frankfurt. ―We are very happy with this co-location as it is the first time we are working together with another exhibition brand. I am convinced that the industry will appreciate this cooperation, especially those in the USA. 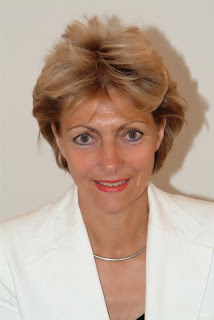 Added Michael Jaenecke, Director Brand Management Techtextil, Messe Frankfurt Exhibition GmbH, Germany. JEC is the largest composites industry organization in Europe and in the world with a network of 250,000 professionals. JEC represents, promotes and expands composites markets by providing global or local networking and information services. Through knowledge and networking, the JEC experts offer a comprehensive service package: the JEC publications – including strategic studies, technical books and the JEC Composites Magazine – the weekly international e-letter ―World Market News‖ and the French e-letter JEC Info Composites. JEC also organizes JEC Europe Show in Paris – world and European leader, strongly supported by the industry and five times bigger than any other composites exhibition – JEC Asia in Singapore and JEC Americas in Boston, the Web Hub www.jeccomposites.com, the JEC Composites Conferences, Forums and Workshops (including I.C.S., the Innovative Composites Summit) in Paris, Singapore and Boston, and the JEC Innovation Awards program (Europe, Asia, America, India and China).The composites industry employs 550,000 professionals worldwide and generates 110 billion dollars worth of business. David Trumbull, who consults to the textile industry, and colleague Jim Carson, are on the speaking program for the May event in Atlanta. "U.S. Customs and Border Protection (CBP) has not regularly assessed ports for risks to cargo under its Container Security Initiative (CSI) program. CBP's selection of the initial 23 CSI ports was primarily based on the volume of U.S.-bound containers, but beginning in 2003, CBP considered more threat information when it expanded the number of CSI ports. CBP has not assessed the risk posed by foreign ports that ship cargo to the United States for its CSI program since 2005. In 2009, CBP developed a model that ranked 356 potential expansion ports for a related program on the basis of risk, but it was never implemented because of budget cuts. By applying CBP's risk model to fiscal year 2012 cargo shipment data, GAO found that CSI did not have a presence at about half of the ports CBP considered high risk, and about one fifth of the existing CSI ports were at lower risk locations. Since the CSI program depends on cooperation from sovereign host countries, there are challenges to implementing CSI in new foreign locations, and CBP's negotiations with other countries have not always succeeded. For example, CBP officials said it is difficult to close CSI ports and open new ports because removing CSI from a country might negatively affect U.S. relations with the host government. However, periodically assessing the risk level of cargo shipped from foreign ports and using the results to inform any future expansion of CSI to additional locations, as well as determine whether changes need to be made to existing CSI ports, would help ensure that CBP is allocating its resources to provide the greatest possible coverage of high-risk cargo to best mitigate the risk of importing weapons of mass destruction (WMD) or other terrorist contraband into the United States through the maritime supply chain." The full report is available online at http://www.gao.gov/assets/660/657893.pdf. Unless you work for the United States government a shutdown of a few days, or even weeks, is unlikely to affect you. Retirees and the disabled with still get their Social Security checks. The Department of Defense will remain in readiness whenever and wherever needed. Air traffic controllers are on the job facilitating travel. It has been said that if the radio, television, and newspapers closed down along with the government, most Americans wouldn't even know there was a government shutdown. Oh, yes, and one other thing, the Internal Revenue Service cannot audit you during the shutdown. I'm one of the small number of non-government employees affected by the shutdown. I have scheduled meetings in Washington with the Federal Trade Commission on behalf of a client. Those meetings are canceled. The Federal Trade Commission protects American consumers from fraud in many forms. 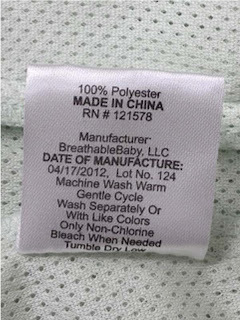 Of interest to my clients in the textile and apparel industries is protection from apparel with misleading labeling. In my two decades' experience handling FTC apparel labeling issues, I have seen that mislabeling which defrauds America consumers is more likely in the case of imported apparel. The FTC is closed for the shutdown. The Consumer Product Safety Commission protects consumers from unsafe products. A quick perusal of CPSC's database of unsafe product recalls reveals that the bulk of unsafe products are imported. CPSC is closed for the shutdown. The United States International Trade Commission investigates allegations of unfair trade practices relating to imports and maintains an online database of imports so that trends in imports can be followed. The USITC is closed for the shutdown and even access to the online database has been blocked. The Department of Commerce, which includes the Office of Textiles and Apparel, assists U.S. manufactures to be competitive in the world market. According to the Washington Post, "Of the Commerce Department’s 46,420 employees, 40,234 will be furloughed. The bulk of the non-furloughed employees are at the National Oceanic and Atmospheric Administration, where 5,368 of the agency’s 12,001 workers will remain on the job preparing weather, shipping and other reports important for public safety and the economy." Apparently the offices at Commerce with assist U.S. industry are closed. Customs and Border Protection facilitates imports of foreign-origin merchandise. As of July 31, 2013, CBP had 59,561 on-board employees. CBP estimates 52,673 employees as the total number to be retained during the shutdown. CBP will continue passenger processing and cargo inspection functions at ports of entry. There you have it! The agencies that assist America consumers and manufacturers are closed. The agency which facilitates foreign competitors to get into the U.S. market is open for business and nearly fully staffed. Such are the priorities in Washington. Federal Prisons Industries, Washington, D.C., was awarded a $246,699,217 non-multi-year, no option, firm-fixed-price contract. This five-year requirements contract is to procure Interceptor Body Armor Outer Tactical Vests for various foreign military sales customers to be awarded on individual delivery orders. Funding and performance location will be determined with each order. The contract had one bid solicited and one bid received. The U.S. Army Contracting Command  Aberdeen Division, Aberdeen Proving Ground, Md., is the contracting activity (W91CRB-13-D-0028). Sterlingwear of Boston, Inc., East Boston, Mass., has been awarded a maximum $9,005,933 firm-fixed-price contract for field jackets for the Afghanistan National Police. This contract is a competitive acquisition, and two offers were received. Location of performance is Massachusetts and Afghanistan with an April 21, 2014 performance completion date. Type of appropriation is fiscal year 2013 defense working capital funds. The contracting activity is the Defense Logistics Agency Troop Support, Philadelphia, Pa., (SPM1C1-13-D-1076). Consumer Product Safety Commission. CPSC will update with information about imminent risks only during the government shutdown. Read CSPC Shutdown Plan here. Department of Commerce, which includes the Office of Textiles and Apparel. According to the Washington Post, "Of the Commerce Department’s 46,420 employees, 40,234 will be furloughed. The bulk of the non-furloughed employees are at the National Oceanic and Atmospheric Administration, where 5,368 of the agency’s 12,001 workers will remain on the job preparing weather, shipping and other reports important for public safety and the economy. The Patent and Trademark Office, because of the fees it collects, has enough independent funding to remain open for four weeks – but would close as well in any extended government shutdown. The Bureau of Industry and Security, responsible for reviewing exports under U.S. national security laws, will keep 150 employees – nearly half its workforce – on duty." Department of Defense. According the Washington Post, "The Defense Department will continue to conduct military operations and training exercises. The roughly 1.4 million active-duty uniformed military personnel will stay on the job. Of the department’s 800,000 civilian workers, about half will be furloughed. Those deemed essential because they are critical to safety missions, or are actively participating in or supporting a military operation, will continue to work." Department of Homeland Security, which includes Customs and Border Protection. As of July 31, 2013, CBP had 59,561 on-board employees. CBP estimates 52,673 employees as the total number exempt and estimated to be retained during a federal funding hiatus. These employees are exempt since they are Presidential appointees, law enforcement officers, funded by other than annual appropriations, or necessary for the protection of life and property. CBP will continue passenger processing and cargo inspection functions at ports of entry. Read the DHS Shutdown Plan here. Federal Trade Commission. FTC is closed due to the government shutdown. Read the FTC Shutdown Plan here. Executive Office of the President, which includes the Office of the United States Trade Representative. USTR will furlough about 75% of its employees during the shutdown. Read the EOP Shutdown Plan here.